Studied bass trombone with Alan Raph (NYC). Subed extensively in NYC from about 1973 to 1987. Subed in Glenn Miller Band, Tommy Dorsey Band, Less and Larry Elgart Band, Carnegie Hall Jazz band and many others. 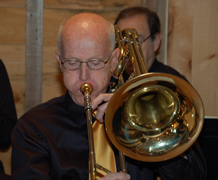 18 years bass trombone with the Jay Owen Orchestra. Attend and play at the summer re-unions of the Auburn Knights Alumni Association (Auburn University, Alabama) in July.